Important This feature requires an InLoox PM Enterprise Server or an InLoox now! account. Starting with InLoox 10, you can easily access your project data offline. As soon as InLoox reconnects to the database (InLoox PM Enterprise Server) or the cloud (InLoox now! ), the data is automatically synchronized. The last-update-wins principle applies, i.e. the last changes are saved as the current data record. Whether the data of the InLoox PM Server respectively the InLoox now data cloud or the data of the client are prioritized in case of processing conflicts can be set in the InLoox options for all users. Read here how to proceed. Not the entire database is cached locally on the user's device, but only the data for which the user is authorized is stored. For example: There are 100 projects, but you only have read and edit permissions for 20 projects. Then only the data of these 20 projects will be cached for working offline and then again synchronized when you are online again. InLoox does not directly fetch or write data from/to the SQL database during the synchronization. The Outlook client communicates with InLoox Web App. Web App only needs to be installed, you do not need to have any Web User or Universal User licenses. The only requirement is that you have an InLoox PM Enterprise Server and install the Web App server. Please, refer to the whitepaper on the InLoox PM Server and Web App installation. Offline availability is being prepared. This process can take a few minutes, depending on how much data InLoox has to synchronize. 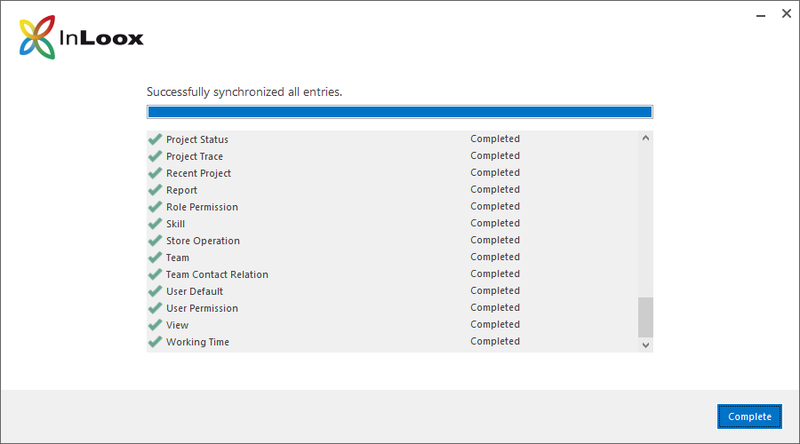 To follow the synchronization process, double-click on in the Windows toolbar to open the synchronization window. Once all entries have been synchronized, you can click on Complete. 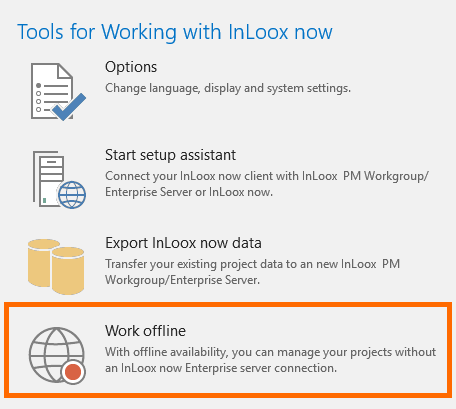 Tip To check whether offline availability is activated, click on File -> InLoox PM/now. If the feature is active, available offline appears next to the account name under Account information. NOTICE You specify these settings in the InLoox options. For this you need administrator permissions. By default, client-side changes are preferred for resolving editing conflicts during the synchronization of the same online and offline data entries. 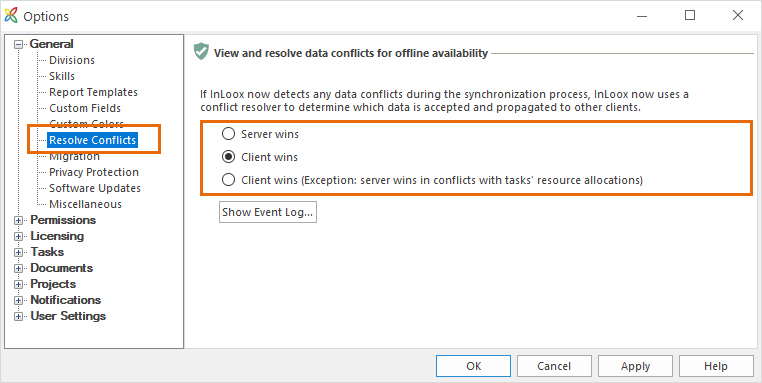 You can change this default setting in the InLoox options under General >> Resolve Conflicts. If errors occur during synchronization, they are displayed in an InLoox notification window. If you click on it, the event log opens and displays these errors. In this case, please contact your administrator or IT manager to ensure that a connection to the InLoox PM Server or InLoox now! cloud can be established. If you need technical support, please send a ticket via the InLoox website or get in touch with your InLoox contact person. InLoox now! users with two or more accounts can easily switch between them. You can now work in different accounts (=project data sets/database), e.g. a management accounts and an employee account. Important You must use the same login data for both accounts, i.e. the same email address and the same password. 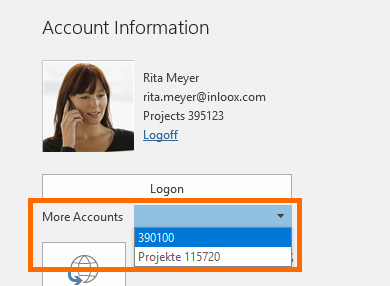 Under Account Information -> More Accounts select an account from the drop-down menu. If you have an Office 365 Business account, you can simply log on to InLoox now! with the same authentication without setting up an authentication in the InLoox options. 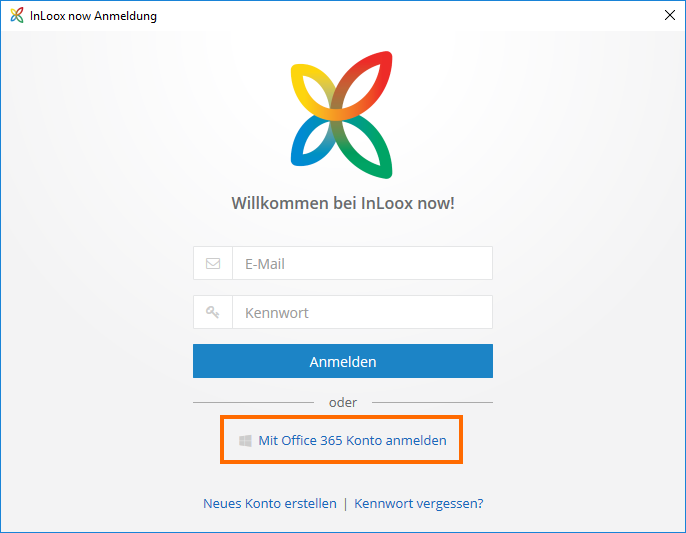 To do this, simply select the "Log in with Office 365 account" option in the login dialog window and enter your login information. You can now add emails to one or more InLoox projects with just one click - directly from your email preview window. The One Click bar shows you your most recent projects. You can also create a task from an email and/or save an email as a document at the same time. The blue bar above the email indicates whether the email was added to a project as a task or document (or both). 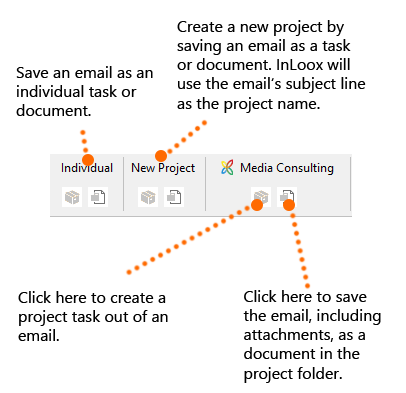 Just click on the project name or on the icons, then the Kanban board or the specific document folder of the project the email was added to will open. Flexibility and integration - InLoox • Copyright 1999-2019 © InLoox, Inc. All rights reserved.